A Government of India-sponsored study has raised the alarm that 1.24 million deaths, or 12.5% of the total deaths, in India in 2017 were "attributable" to air pollution, which is one of the highest in the world. Titled "The impact of air pollution on deaths, disease burden, and life expectancy across the states of India: the Global Burden of Disease Study 2017", the study, funded by the Funding Bill & Melinda Gates Foundation, says, this suggests India has a "disproportionately high mortality and disease burden due to air pollution." Also supported by the Indian Council of Medical Research, the study says that the population-weighted mean PM2.5 (atmospheric particulate matter that have a diameter of less than 2.5 micrometers, which is about 3% the diameter of a human hair) in India in 2017 was 89.9 μg/m3 (concentration of an air pollutant [eg. ozone] in micrograms [one-millionth of a gram] per cubic meter air). It adds, though India made up 18.1% of the global population, it had 26.2% of the global DALYs attributable to air pollution in 2017. At the same time, the study, published in well-known health journal, Lancet, states, the disability-adjusted life-years (DALY) rate -- a measure of overall disease burden, expressed as the number of years lost due to ill-health, disability or early death -- attributable to air pollution in India in 2017 was much higher for lower respiratory infections than the rate attributable to tobacco use. The annual exposure to ambient particulate matter, as the population-weighted mean PM2.5, in India in 2017 was 89.9 μg/m3, which was one of the highest in the world. The highest annual population-weighted mean PM2.5 in India in 2017 was in Delhi (209.0 μg/m3, followed by Uttar Pradesh, Bihar, and Haryana in north India (range 125.7–174.7 μg/m3), and then in Rajasthan, Jharkhand, and West Bengal (range 81.4–93.4 μg/m3. Exposure was highest in the low socio-demographic index (SDI) state group (125.3 μg/m3). Of the total population in India in 2017, 42.6% of residents were exposed to mean PM2.5 greater than 80 μg/m3 and 76.8% were exposed to mean PM2.5 greater than 40 μg/m3, which is the limit recommended by the National Ambient Air Quality Standards in India. Across the states of India, the annual population-weighted mean PM2.5 exposure was 12.1 times greater in the state with the highest exposure than in the state with the lowest exposure in 2017. In 2017, 1.24 million deaths in India were attributable to air pollution. Of the total deaths in India in 2017, 12.5% could be attributed to air pollution; this proportion was 10.8% in people younger than 70 years and 15.1% in those aged 70 years or older. 51.4% of the deaths attributable to air pollution in India in 2017 were in people younger than 70 years. This proportion was higher in the low SDI group than the high SDI group, but there were variations within each SDI state group. For example, in the low SDI state group, this proportion was higher in Jharkhand, Chhattisgarh, and Bihar than in the other states, and in the high SDI state group, there was a striking contrast between states, with Punjab having a much higher proportion than Kerala. Across the states of India, the proportion of deaths attributable to air pollution in 2017 was 3.1 times greater in the state with the highest proportion than in the state with the lowest proportion. The number of deaths attributable to ambient particulate matter pollution in India in 2017 was 0.67 million and the number attributable to household air pollution was 0.48 million. 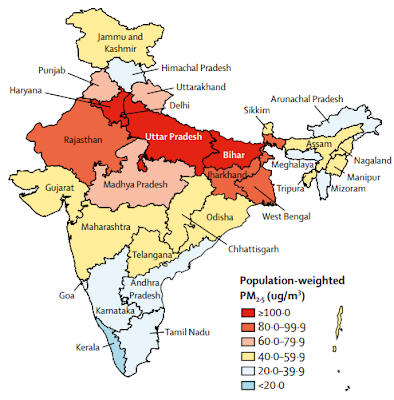 Among the low SDI states, the point estimate of the number of deaths attributable to ambient particulate matter pollution was two times higher than that of household air pollution in Uttar Pradesh and 1.4 times higher in Bihar, although with wide uncertainty ranges, consistent with the very high exposure to ambient particulate matter pollution in these states. In most of the other low SDI states, however, the point estimate of the number of deaths attributable to household air pollution was higher than that of ambient particulate matter pollution, but again with wide uncertainty ranges. Delhi, in the high SDI state group, stands out as having an extreme contrast between the deaths attributable to ambient particulate matter pollution. Two other north Indian states, Haryana and Punjab, also had a higher number of deaths attributable to ambient particulate matter pollution than attributable to household air pollution. In two neighbouring high SDI states in south India, Tamil Nadu and Kerala, Tamil Nadu had twice the number of deaths attributable to ambient particulate matter pollution than to household air pollution, whereas Kerala had a similar number of deaths attributable to ambient particulate matter pollution than to household air pollution. These findings were consistent with the higher exposure levels to ambient particulate matter pollution in Tamil Nadu than in Kerala, and vice versa for household air pollution exposure. The point estimate for the number of deaths attributable to ambient particulate matter pollution in males in India in 2017 (0.39 million) was 38.3% higher than for females (0.28 million). By contrast, the point estimate for the number of deaths attributable to household air pollution in India in 2017 was 17.6% higher for females (0.26 million) than for males (0.22 million). Although the direction of these male versus female trends was similar in most states, there were many variations between the states in the magnitude of these differences. Of the total 480.7 million disability-adjusted life-years (DALYs) in India in 2017, 38.7 million or 8.1% were attributable to air pollution. 21.3 million or 4.4% of the total DALYs were attributable to ambient particulate matter pollution, 15.8 million or 3.3% were attributable to household air pollution, and 2.6 million or 0.5% were attributable to ambient ozone pollution. The 1.38 billion people in India in 2017 made up 18.1% of the global 7.64 billion population, but India had 38.7 million (26.2%) of the global 147.4 million DALYs attributable to air pollution in 2017. The DALY rate attributable to household air pollution in 2017 was 1.9 times higher in the low SDI group than in the high SDI group and the rate attributable to ambient particulate matter was 1.4 times higher in the low SDI group than the high SDI group. The DALY rate attributable to ambient particulate matter pollution was highest in the north Indian states of Uttar Pradesh, Haryana, Delhi, Punjab, and Rajasthan, spread across the three SDI state groups. The DALY rate attributable to household air pollution was highest in the low SDI states of Chhattisgarh, Rajasthan, Madhya Pradesh, and Assam in north and northeast India. The highest DALY rate due to household air pollution was 144.8 times the lowest rate and the highest rate due to ambient particulate matter pollution was 5.6 times the lowest. The overall DALY rate attributable to air pollution was highest in the states of Rajasthan, Uttar Pradesh, Chhattisgarh, Madhya Pradesh, Haryana, Bihar, and Uttarakhand. Of the total DALYs attributable to air pollution in India in 2017, the largest proportions were from lower respiratory infections (29.3%), chronic obstructive pulmonary disease (29.2%), and ischaemic heart disease (23.8%), followed by stroke (7.5%), diabetes (6.9%), lung cancer (1.8%), and cataract (1.5%). The DALY rate attributable to air pollution in India in 2017 was much higher for lower respiratory infections than the rate attributable to tobacco use. For non-communicable diseases, including chronic obstructive pulmonary disease, ischaemic heart disease, stroke, diabetes, lung cancer, and cataract, the DALY rate attributable to air pollution was at least as high as the rate attributable to tobacco use. If the air pollution levels in India had been lower than the theoretical minimum risk exposure levels associated with health loss, the average life expectancy in India in 2017 would have been higher by 1.7 years, with this increase exceeding 2 years in the north Indian states of Rajasthan, Uttar Pradesh (2.2 years), and Haryana (2.1 years). If the exposure to ambient particulate matter pollution had been lower than the minimum levels associated with health loss, the average life expectancy would have increased in India by 0.9 years, with the highest increase in Delhi (1.5 years), Haryana (1.4 years ), Punjab (1.3 years) and Uttar Pradesh (1.3 years). If the exposure to household air pollution due to solid fuels had been lower than the minimum levels associated with health loss, the average life expectancy would have increased in India by 0.7 years (0.6–0.8), with the highest increase in Rajasthan (1.0 years), Chhattisgarh (0.9 years), and Madhya Pradesh (0.9 years). Generally, across the states, this beneficial impact on life expectancy would have been slightly higher for males in relation to ambient particulate matter pollution and slightly higher for females in relation to household air pollution.